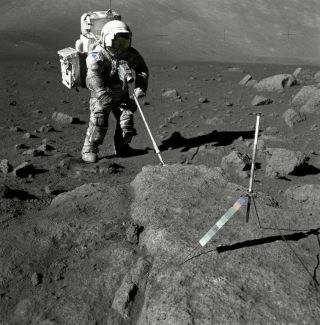 Apollo 17 astronaut Harrison Schmitt uses a scoop to snag lunar samples in December 1972. Newly restored lunar-data tapes show the Apollo astronauts' activity warmed the moon's surface slightly. When astronauts walked or drove their moon rover near buried heat-flow probes, the activity disturbed and displaced surface soil, exposing the darker dirt below. This newly unearthed material absorbed more sunlight, causing the soil to heat up, according to the study. "In the process of installing the instruments, you may actually end up disturbing the surface thermal environment of the place where you want to make some measurements," lead author Seiichi Nagihara, a planetary scientist at Texas Tech University in Lubbock, said in a statement. "That kind of consideration certainly goes into the designing of the next generation of instruments that will be someday deployed on the moon." Astronauts deployed the heat-flow probes during the Apollo 15 and Apollo 17 missions, in 1971 and 1972. The goal was to determine how much heat moves from the lunar interior to the surface, which in turn would yield insights about the moon's structure and composition. The probes operated through 1977, beaming data home to NASA's Johnson Space Center (JSC) in Houston. (Apollo 17 was the last crewed lunar mission; nobody has set foot on the moon since then.) JSC preserved these data on magnetic tapes, which were later archived at the National Space Science Data Center, a facility at the agency's Goddard Space Flight Center in Greenbelt, Maryland. Well, some of the tapes were archived — the ones recorded from 1971 through December 1974. The rest were apparently left with the researchers who studied them, and most of them have since been lost. The measurements made through 1974 showed a slight uptick in temperatures in the lunar near-surface over the previous few years — a trend that puzzled researchers at the time. Nagihara and his colleagues set out to investigate this mystery, and step one involved finding the missing data. They discovered that NASA had stored additional Apollo heat-probe measurements on a different, heretofore forgotten set of tapes, 440 of which the team found at the Washington National Records Center in Suitland, Maryland. Those 440 covered the period from April 1975 through June 1975. Left: This photo by Apollo 15 astronaut James Irwin shows the borestem and cable of a heat-flow probe 1 protruding from the ground. Astronaut footprints can be seen around the borestem. Right: This photo by Harrison Schmidt shows the borestem and cable of the Apollo 17 Probe 2 protruding from the ground. And, at the Lunar and Planetary Institute in Houston, Nagihara and his team unearthed hundreds of weekly logs that recorded heat-probe observations. This bounty allowed them to extend the data record several additional years. The newly recovered and analyzed data showed that the subsurface warming at the heat-probe sites continued through the end of the instruments' operational lives in 1977. The team's work also revealed that the temperature rise was greater closer to the surface, strongly suggesting that the warming started up top and worked its way down. The researchers then studied observations of the Apollo 15 and Apollo 17 landing sites made by NASA's Lunar Reconnaissance Orbiter (LRO), which has been circling the moon since 2009. The LRO photos indicated that the warming was likely a localized, not moonwide, phenomenon: Astronaut activity had darkened the soil in these areas, which in turn warmed the soil. That warming was fairly significant, at least above ground: Nagihara and his team calculated that a surface-temperature rise of 2.9 to 6.3 degrees Fahrenheit (1.6 to 3.5 degrees Celsius) at the time of the probes' deployment meshes well with the rise they detected underground over time. The study was published April 25 in the Journal of Geophysical Research: Planets.